A new affordable housing option will soon open in Santa Barbara County. 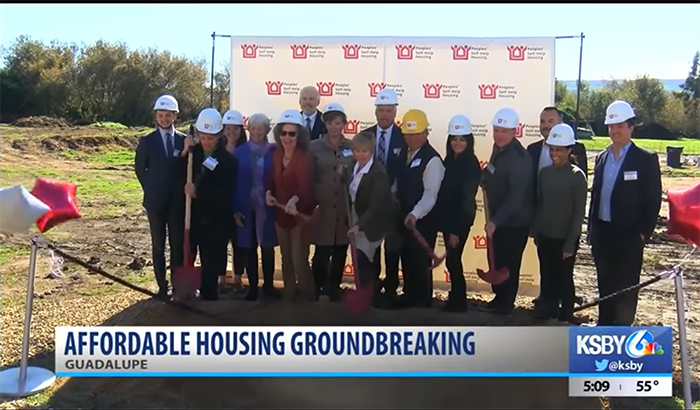 Peoples’ Self-Help Housing, which is a Central Coast non-profit dedicated to providing affordable homes, held a groundbreaking ceremony Thursday for what will eventually be known as Guadalupe Court. There will be 38 units of affordable housing, specifically for farmworkers and their families. The property is located at 4202 11th Street. The two-acre development will eventually feature housing, an outdoor courtyard and barbecue area, play area, and a community center. There are several rental options, including one, two, and three-bedroom units. Rents will vary from $600 to $1,400 a month. “Obviously there’s a big income gap between affordability, what rents are, and homeownership and wages. It’s been a gap that as we all know, has been expanding over a period of time and continues to,” said John Fowler, President and CEO of Peoples’ Self-Help Housing. The project will cost about $14 million and is expected to be complete in the next 18 months. The U.S. Department of Agriculture, National Equity Fund, Chase, California Community Reinvestment Corporation, and NeighborWorks America helped to provide funding for the project. CSA Architects, Civil Design Studio, and Robert Andrew Fowler Landscape Architect are development partners.